Registering online on our secure site is the quickest way to register early and ensure you get your first choice of ticketed courses and events before they’re sold out. If you are registering by fax or by mail, please review the Registration Form as there are additional administration fees associated with this. The administration fees are clearly outlined on the Registration Form. 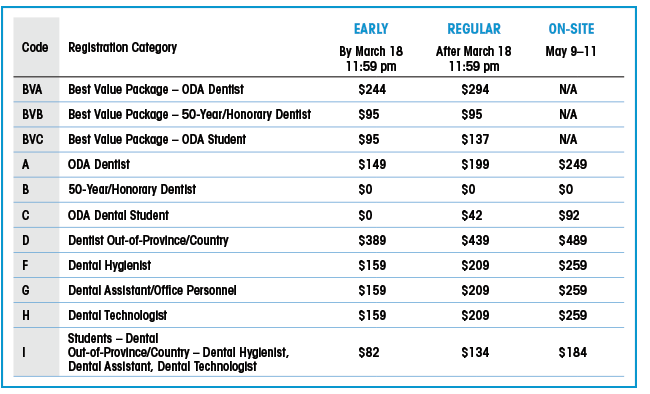 At the Annual Spring Meeting (ASM), Category 1 (Core) courses and hands-on workshops have an additional fee. Category 2 and 3 lectures are included in your general ASM registration fee. New for 2019: Register in advance for free tickets to reserve your spot at these popular courses. All tickets for your preferred course claimed? Forget to register for your preferred course? Change your mind? Arrive late? You can still try your luck onsite! Those in each stand-by line can access any available seats on a first-come, first –served basis, immediately after the published start time of the course. Attendees with exhibitor badges cannot access any paid or free courses and workshops. Cancellation/Refunds Policy Requests for cancellations and refunds for conference registration and ticketed events must be in writing and postmarked no later than 11:59 p.m. Eastern Time on March 18, 2019. Refunds that are requested after this date will not be granted including requests made based on absence due to illness, late arrival for courses, weather, and/or parking difficulties. There will be no exceptions to this cancellation policy. A $50.00 processing fee will be deducted from all refunds. Conference badges and tickets must be included with the cancellation/refund request. All refunds will be processed by Friday, June 7, 2019. Important: No refunds will be issued onsite at the ASM. The ODA does not engage the services of a convention bureau. There may be fraudulent companies posing as legitimate third-party vendors (e.g. registration and/or housing companies) marketing their services for the ASM19. Attendees may be asked to pay registration fees or housing deposits to these companies only to arrive onsite at the event to find that there are no records of their registrations of hotel reservations.